Explanation: On September 18, the setting Sun illuminated both sides of the steep brick and steel canyon otherwise known as Jasper Avenue in downtown Edmonton, Alberta, Canada, planet Earth. The Stonehenge-like alignment is captured from the middle of the road in this daring snapshot. 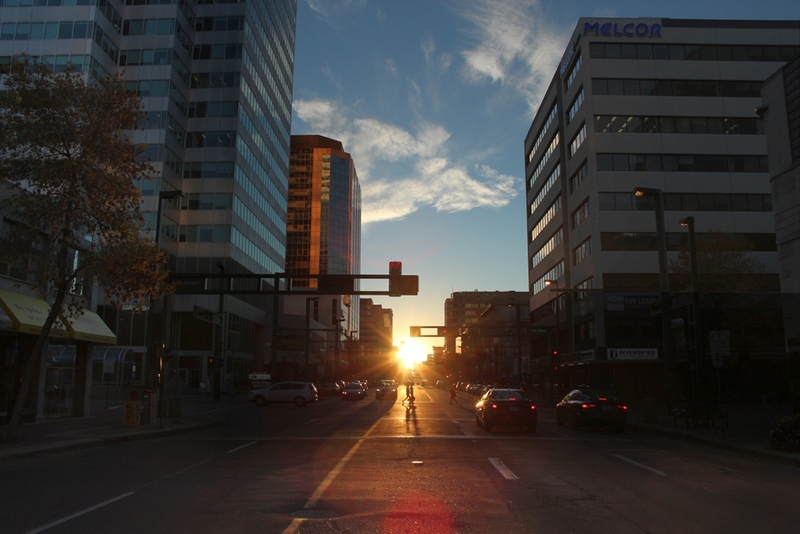 In Edmonton streets are laid out on a grid almost oriented along the cardinal directions, so aligned Edmonton sunsets (and sunrises) occur along the nearly east-west streets twice a year, close to the Equinox. In fact, at today's Equinox, the Sun crosses the celestial equator at 1421 UT and on this day the Sun will rise due east and set due west, bringing approximately equal hours of day and night to denizens of planet Earth. The September Equinox marks the astronomical beginning of Fall in the north and Spring in the southern hemisphere.